Governor O. Max Gardner is sure to be mentioned whenever North Carolina is facing tough economic times and people start thinking about whether government is organized effectively. 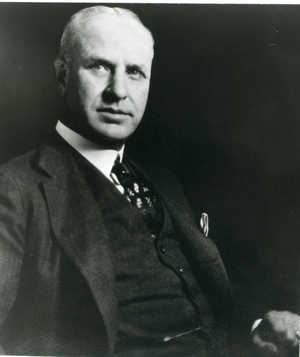 In the midst of the Depression, Gardner asked the Brookings Institution to study comprehensively the administration and organization of state and local government. Brookings submitted recommendations that were influential in shifting responsibility for financing schools, roads and prisons from counties to the state, as well as responsibility for administering the last two functions. According to State and Local Government Relations in North Carolina, “[t]he responsibilities of the state government and the counties were suddenly, radically, and permanently changed.” Not all of the recommendations by Brookings were accepted. They also suggested “a different scheme of government wherein the counties may gradually be liquidated as political subdivisions.” Not so much. The Brookings study must be counted among the most influential in North Carolina’s history. Albert Coates characterized the need to contract with Brookings as negative, however, and it was one of his many rationales for creating the Institute of Government. According to Howard Covington, Coates believed that “[f]uture governors should be relieved of the need to go out of state for help with reform, as Gardner had done in hiring the Brookings Institution. This work could be done at home with honest, earnest, and intelligent North Carolinians.” It was classic for Coates to promise that his not-yet-created Institute would be capable of conducting transformative studies like the one by Brookings. Coates was conducting his own study of the criminal justice system, and he apparently believed that the Institute of Government would be able to tackle any subject. Governor Perdue recently reported that she has been studying O. Max Gardner. In reflecting on the financial challenges facing the state, she has observed “it’s time for us to transform the way we do business in North Carolina.” John Drescher (News & Observer) recently challenged Governor Perdue to follow Gardner’s example by studying and reforming our current state government. Coates believed that a well-trained lawyer was a generalist who could tackle any project. Today we think of ourselves much more as specialists rather than generalists, and that is true whether a faculty member is trained as a lawyer or in another discipline. That tendency may make it harder for us to imagine taking on projects that require broad knowledge outside our area of specialization. As we think about ways for the School to have a greater impact, are studies like the one conducted by Brookings the sort of work we should do?